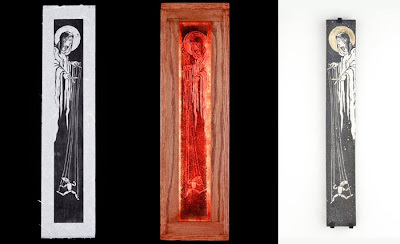 middle: glass, oak, flourescent lighting | 9" x 30" x 6"
right: concrete, grout, gold leaf | 3.5" x 24"
Kirk Waldroff, a DC-based printmaker and sculptor who uses traditional woodcut techniques to create non-traditional prints in glass, concrete and on paper has been for quite sometime one of my favorite up-and-coming artists around here. Why? It helps that we seem to share an interest in some of the same subject matter that interests me as his work often depicts invented saints and never-told fables. He invents the saints in the same way that I invent medals and ribbons for non-existing conflicts and he invents new or non-existing fables while I often draw inspiration from the real ones. 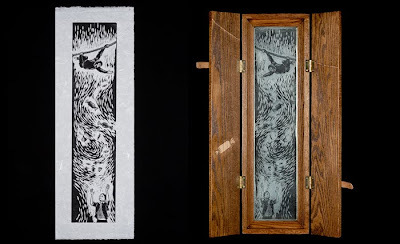 left: woodcut print on Rives BFK | edition of one | 7" x 32"
He has a show opening this coming January at Northern Virginia Community College's Waddell Gallery in Sterling, VA and the reception is Friday, January 22, 6:30pm - 8:30pm and there's also a gallery talk on Wednesday, January 20, at noon. Blake Gopnik began a series in this morning's Washington Post on his experiment with "extreme connoisseurship," which entails looking at "a tiny corner of one work. If the art is really good, there will be at least a morning's worth of looking in a few square inches of it." In his first foray, he visits The Phillips Collection to look at the wine glasses on the table at the center of that collection's most famous work, "Luncheon of the Boating Party," by Pierre-Auguste Renoir. Gopnik admits that, "It isn't how most of us look at pictures. It's not even how most critics or scholars get to look at art, most of the time. But give it a chance, and it's the best kind of looking there is." I'll have to re-read the Gopnik piece, which at first reading just sounded like art jargon semantic kabuki to me. But a closed mind is just as bad, so I'll give it a try again. The WaPo readers' comments (as usual) are also precious!